Crowning the tip of Michigan's little finger like a diamond ring is Leelanau State Park, a 1,350-acre unit of spectacular views that are seen along miles of lakeshore, from platforms on top of dunes, even from the tower of a lighthouse. The park is separated into two main regions. 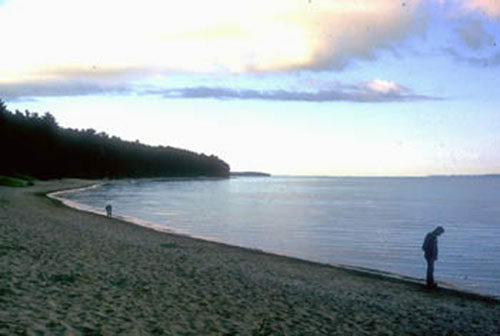 The smaller section preserves the tip of the Leelanau Peninsula and includes the campground, day-use area and historic Grand Traverse Lighthouse.Located to the south along Cathead Bay is the bulk of the park. This undeveloped area contains contains most of the park's 1.5 miles of shoreline and all of its trails. It also features the park's best beaches. Crowning the tip of Michigan's "little finger" like a diamond ring is Leelanau State Park, a 1,350-acre unit of spectacular views that are seen along miles of lakeshore, from platforms on top of dunes, even from the tower of a lighthouse. The park, located in Leelanau County and guarding the entrance of the Grand Traverse Bay, is separated into two main regions. The smaller section preserves the tip of the Leelanau Peninsula and includes the campground, day-use area and historic Grand Traverse Lighthouse. Located to the south along Cathead Bay is the bulk of the park. This undeveloped area, a rolling terrain of low dunes forested in hardwoods of maple, beech, white ash and birch, contains most of the park's 1.5 miles of shoreline and all of its trails. It also features the park's best beaches, a wide, sandy shoreline that can only be reached after a mile hike from a parking lot. 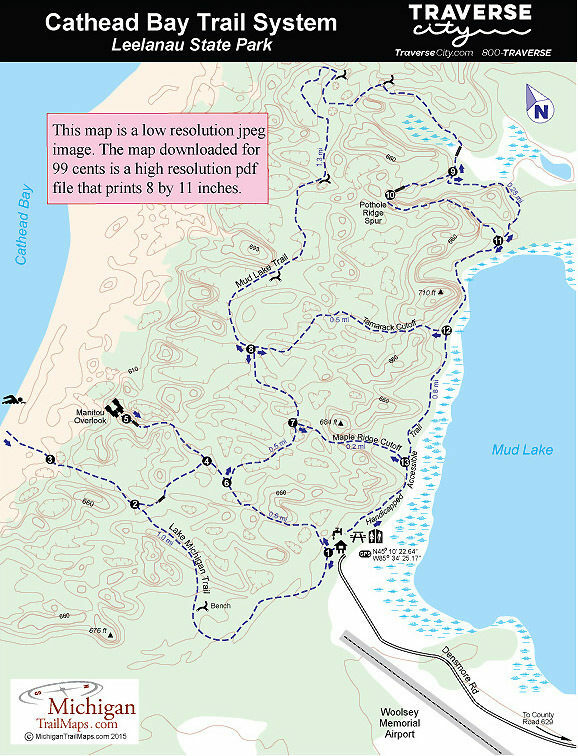 Leelanau has an excellent trail network that forms almost 6 miles of loops through the Cathead Bay region of the park. The trailhead and parking lot is at the end of Densmore Road, located 5 miles south of the campground via County Road 629. The longest loop is Mud Lake Trail, a 3-mile hike through the hilly interior and along the shoreline of the inland lake. Two spurs that shorten the Mud Lake Trail are passed along the way; Maple Ridge Cutoff and Tamarack Cutoff. The most popular hike is the Lake Michigan Trail with the Manitou Overlook cutoff with the spurs to the beach and the observation deck. Manitou Overlook is at the end of a long stairway to the top of a dune, where there is an observation deck. The view from here is spectacular, and on a clear day you are able to see the Fox Islands out in Lake Michigan. It's also a superb place to catch the sunset as the orange orb melts over North Manitou Island. This loop is an easy hike of 2.2 miles. Combine all of these trails and you have the Lake Michigan/Mud Lake Loop, a 4.7-mile trek that makes for a pleasant three-hour walk or even a full day outing if combined with an extended break on the beach. The park is not only popular during the traditional summer season but also in autumn for fall colors, while the undeveloped Cathead Bay receives its greatest use during the winter from Nordic skiers. Trails are skier-set and skiers have a choice of a number of loops. Much of the north end of the Mud Lake Trail, however, is not well suited for novice skiers. Densmore Road and the trailhead parking lot are plowed. 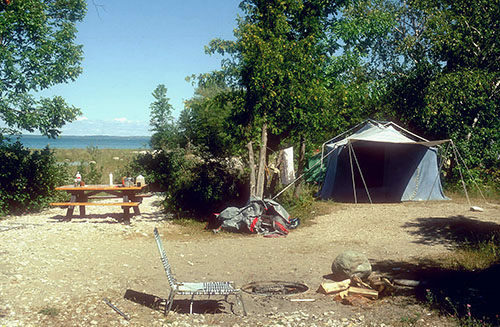 The state park has a campground of 52 rustic sites located at the tip of the Leelanau Peninsula. Although the shoreline here is composed of pebbles and stones, 10 sites are right along the water and another 25 have a fine view of Lake Michigan. These, naturally, are often the first to be reserved. The area, which also includes two Mini-cabins, is well wooded and despite primitive facilities is still a very popular campground, filling daily from July through Labor Day and more than 50 percent full during June. The Grand Traverse Lighthouse towers over the park's picnic facility making the grassy area an especially scenic place to enjoy an outdoor meal. There is parking for 50 cars and a picnic shelter but no bathhouse facilities or swimming area, as the shoreline is composed of pebbles and stones. Petoskey stone hunters can often been seen searching the beach here for the state stone. 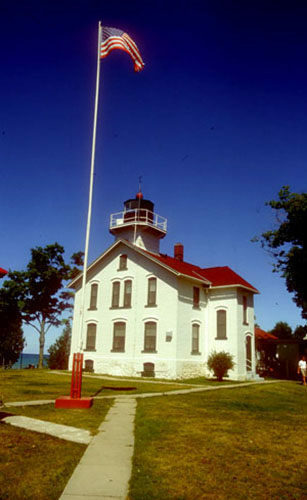 The Grand Traverse Lighthouse, built in 1916, is the most recent light in a series that have been guiding ships around the peninsula since 1852. A private historical society has since renovated the light and turned it into a maritime museum that includes climbing into the tower for a grand view of Lake Michigan. The museum is open throughout the summer while the remains of an earlier light are posted along the campground loop. The park's campground is located 8 miles north of Northport on County Road 629. Access to the Cathead Bay trailhead is 4 miles north of Northport on Densmore Road. For more information contact Leelanau State Park (231-386-5422). For a campsite or cabin reservation contact Michigan State Park Central Reservations (800-447-2757; www.midnrreservations.com).